Hi everyone! 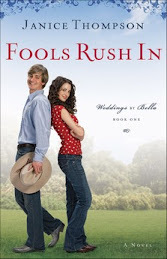 This exciting new blog was created for lovers of the "Weddings by Bella" series by Janice Thompson (Revell Publishers). On this site we will create a cookbook for Aunt Rosa (Italian food, of course). We'll croon the tunes of Dean Martin and Frank Sinatra (That's Amore, y'all!) and chat about how much fun it is to live with crazy family members (Mama Mia!) We'll talk about wedding planning and spice things up by sharing our thoughts on hunky Texas cowboys! Best of all, we'll discuss how our faith impacts our daily lives. C'mon and join the fun, everyone! Hi everyone! This is author Janice Thompson, here with a special invitation to my readers. 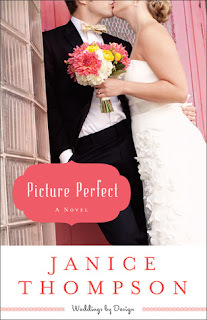 To celebrate to release of my newest book, Picture Perfect, I’m hosting an online party! I’m calling this my “Bing & Bob” party and it will be held on the night of February 18th at 7:00 p.m. central time. Why Bing and Bob, you ask? These two funny fellas hold a special place in the heart of my characters and they will provide the entertainment at our gathering! This fun, interactive party will take place inside the “Bella’s Back” group on facebook. Join me for an interactive chat, video teasers, Bing Crosby music and giveaways! Yes, giveaways! Drawings will be held every ten minutes to give away free copies of the book. At the end of the hour, a very special drawing will be held to give away a brand new kindle fire. How do you enter? Simple! Just join the “Bella’s Back” group. Once inside the group, you can enjoy a video welcome from yours truly and a sample from the Picture Perfect. This will give you a little taste of what’s coming at the party. I can’t wait to share this special evening with my readers to kick off my new Weddings by Design series! Bella’s back, y’all…and things in her world are as wacky and exciting as ever! She’s trying to focus on her future. How can one man make everything feel so . . . fuzzy? Hannah McDermott has a successful photography studio. She’ll soon be featured in Texas Bride magazine. And she has a celebrity client whose Galveston ceremony will be her ticket to the top spot on wedding coordinator Bella Neeley’s list of recommended photographers. But it could all come crashing down around her because of one man: archrival and photographer extraordinaire Drew Kincaid. As the competition between Hannah and Drew heats up, Hannah is surprised to find that it’s not the only thing getting more intense. She can’t get the handsome man out of her thoughts-or even out of her line of sight-and the job of her dreams is turning into a nightmare. Will everything she’s worked for slip out of her hands? And can she see past her pride to find a picture-perfect love? The wedding planning is not an easy one for the engaged couples. Before planning the wedding, the engaged couples have to be aware of the steps of wedding planning. For a perfect assistant help of wedding planning, the wedding planner app will be useful for the engaged couples.